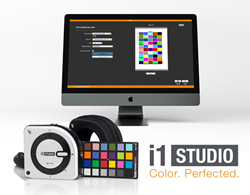 X-Rite Incorporated, the world leader in color management and measurement technologies, is pleased to announce key features and updates for its recently launched i1Studio, the start-to-finish color management solution for photographers, filmmakers and designers of all levels. X-Rite Incorporated the world leader in color management and measurement technologies, is pleased to announce key features and updates for its recently launched i1Studio, the start-to-finish color management solution for photographers, filmmakers and designers of all levels. Perfecting your prints starts with creating the best possible printer profiles. This initial process takes time but the result is worth the effort. The new Data Save Workflow feature in i1Studio works with your schedule. This exclusive feature is now available in i1Studio v1.1 and enables users to start the printer profiling process, pause it any time and resume automatically where they left off, providing a more efficient and flexible workflow. i1Studio device – The all-in-one i1Studio spectrophotometer is the only device color perfectionists need to profile their monitors, scanners, projectors, mobile devices and printers. i1Studio software – The i1Studio software, based on X-Rite’s award winning i1Profiler software, provides an easy to navigate interface that delivers expertly calibrated and profiled monitors for both photo and video as well as projectors, scanners and printers. ColorChecker Camera Calibration Software – Combining the included Classic Target together with the Camera Calibration software provides photographers the ability to set a custom white balance and create a custom camera profile for virtually any lighting situation. ColorTRUE Mobile App for iOS Devices – A simple way to calibrate Apple® iOS mobile devices utilizing the i1Studio hardware for a true mobile to desktop color match of all images. Founded in 1958, X-Rite Incorporated is a global leader in the science and technology of color and appearance. With its wholly owned subsidiary, Pantone, X-Rite employs more than 800 people in 11 countries. The company’s corporate headquarters are located in Grand Rapids, Michigan, with regional headquarters in Europe and Asia and service centers across Europe, the Middle East, Asia and the Americas. X-Rite Pantone offers a full range of solutions used by manufacturers, retailers, printers, photographers, filmmakers, and graphic design houses to achieve precise management and communication of color and appearance throughout their processes. X-Rite Pantone products and services are recognized standards in the printing, packaging, photography, graphic design, filmmaking, automotive, paints, plastics, textiles and medical industries. For further information visit http://www.xrite.com or http://www.xritephoto.com. Pantone LLC, a wholly owned subsidiary of X-Rite Incorporated, has been the world’s color authority for nearly 50 years, providing design professionals with products and services for the colorful exploration and expression of creativity. Always a source for color inspiration, Pantone also offers paint and designer-inspired products and services for consumers. More information is available at pantone.com.